It’s here! 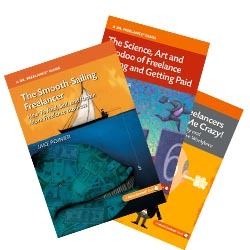 Download Freelance Forecast 2011 (pdf, 1.5MB). Many thanks to all the freelancers and freelance clients who contributed their opinions and insights to the third annual Freelance Forecast. Bookmark or RSS this blog for the announcement of the 2012 survey in December. If you participated this year, you’ll automatically be notified when the new survey comes out. If you didn’t participate this year, please subscribe and indicate your survey preference through the signup form in the right-hand column. I would like to read your survey, being a freelance writer/editor myself. But your link is lunked, at least on my computer. I get a blank page and no download. Your earlier surveys come up as error pages. Please prescribe a remedy. Thanks! Hi Mary: Thanks for letting me know. It appears that my web hosting company was using the Labor Day holiday to do some work under the hood. You should be all set to download! RT @DrFreelance: 2011 #Freelance Forecast survey results: http://t.co/GNnnb6P /Great info for freelance creatives, incl. editorial workers.